And indeed, this is not a specified way of constructing a Date - you don't see it in MDN reference for Date. Notice how it is Sep now instead of Aug. This led to me investigating how the Date constructor works. There are 4 specified ways, of varying convenience, that you can call the constructor. So 8 is treated as the 9th month, which is Sep.
How about the case when we pass in a string? The month is treated more naturally, in this case 8 is parsed as August. So what's left is the case when an array is passed into Date. Seems like a double is rounded down. It sets the internal value of Date to NaN. So what's going on? A quick Google search turned up this StackOverflow result. The answer mentions something about converting the argument into a primitive value by calling an internal method called [[DefaultValue]], which converts the array into a string. I like how concise the article is, but I also felt that it will be instructive to dig deeper into the spec and also the source code. The relevant part of the ES5 spec is section 15.9.3.2. It describes what to do when a single argument is passed to the Date constructor. 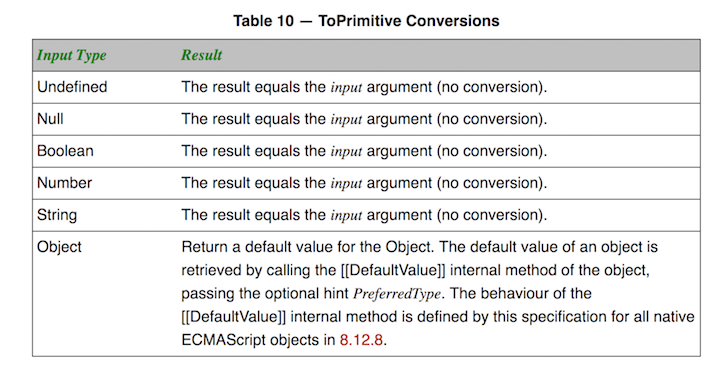 The first step is to convert the input to a primitive value using ToPrimitive, which behavior is detailed in section 9.1 of the same spec. Of the 6 types mentioned above, only Object is not a primitive value. So it needs be converted. The description slightly more involved than what we've seen, so in short, the [[DefaultValue]] of an array is the result of calling toString() on the array. So what really happened was that when we passed  to Date, it is first converted to the string "0", and this falls into case 3 of creating a Date. "0" is successfully parsed into a Date which gives us Jan 1st of 2000. I also wanted to see how the implementation is like so I went around digging. I thought I could find this in V8, but I only found a date.cc that didn't seem to implement the Date constructor. Here you can see the checks for the number of arguments, as well as calling Object::ToPrimitive on the value, and then parsing it if it is a string. Looking around a bit more, I stumbled upon a test file in node, date-constructor.js, which mentions a WebKit bug, that led me to look into WebKit. This has a similar implementation to V8, in DateConstructor.cpp. And if you're willing to dig deeper, you can figure out how toPrimitive is implemented starting from builtins-conversion.cc in V8 and JSObject.cpp in WebKit.